Megan (Keira Knightley) and her boyfriend Andrew (Mark Webber) have been together since high school. In fact, nothing much has changed for Megan since high school even though she’s approaching 30. Then Andrew proposes and Megan is shocked by something so adult encroaching in her life. Chance lets her meet teenaged Annika (Chloë Grace Moretz) who is intrigued by the older woman who behaves so little like an adult. Megan, too, is drawn by Annika’s teenager life and it doesn’t take long for her to move in with her and Annika’s dad Craig (Sam Rockwell) while she mulls over Andrew’s proposal. Laggies may not be my favorite of Shelton’s film but it is sensitive, fun and sweet – just the right fare for a cozy Sunday. Usually the topic of people unwilling to grow up is not my cup of tea. More often than not, it’s the story of a man not wanting to grow up, and I’m just not sympathetic. Girls/women are forced to grow up earlier and faster, so boys can stay boys into a ripe old age and I’m not interested in watching comedies about those boys where the humor is mostly at the expense of women. The rare stories about women not wanting to grow up usually turn out to be actually about some kind of mental health issue for which the not-growing-up was a cover. Laggies comes at things from a different angle. Megan may be a little lost and some of her choices are very questionable, but her mental health isn’t actually in doubt. She really just missed her cue and needs a little help to accept that she isn’t actually a teenager anymore – and that isn’t all bad. So I didn’t mind at all to watch her grow. In fact, I enjoyed it. Megan and her struggles are definitely shown with a lot of humor and ironic distance without losing the emotional connection to her. It’s very much possible to simultaneously shake your head at Megan’s friendship with Annika and still feel for her and understand her motives. The cast is great as well and the soundtrack is really nice, so it has all the right ingredients for a really nice evening. I think the only thing that kept it from being higher up my Lynn Shelton Favorites list is the fact that her other films speak to me more personally. 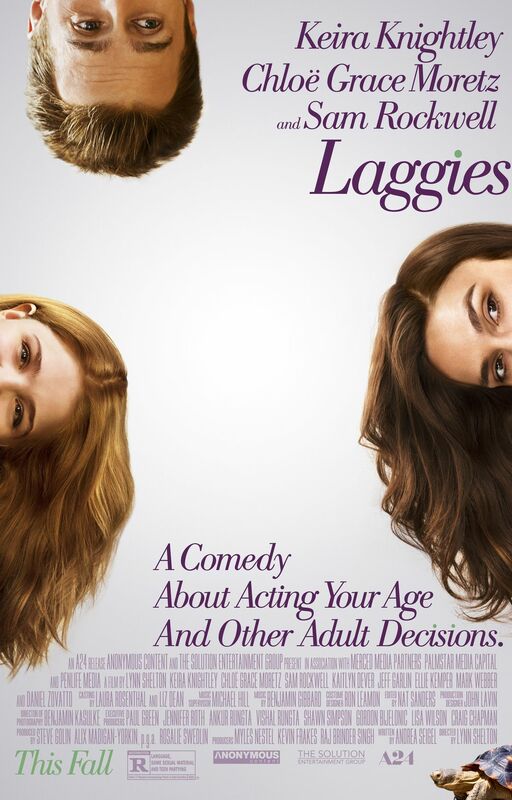 But I don’t see any big faults with Laggies. This entry was posted in female director, female writer, movies and tagged 2014, Andrea Seigel, Chloë Grace Moretz, Ellie Kemper, Keira Knightley, Laggies, Lynn Shelton, Mark Webber, Sam Rockwell by kalafudra. Bookmark the permalink.